This article offers an original analysis of contemporary representations of evolutionary theory. It does so by turning to the lesser-known work of evolutionary biologist Richard Goldschmidt, who placed the “hopeful monster” at the heart of evolution. Diverging from the critiques of evolutionary theory as a colonial, able-ist, racist and misogynist discourse, this article proposes Goldschmidt’s The Material Basis of Evolution as the potential to reconfigure feminist, postcolonial, crip and queer approaches to narratives of origins. 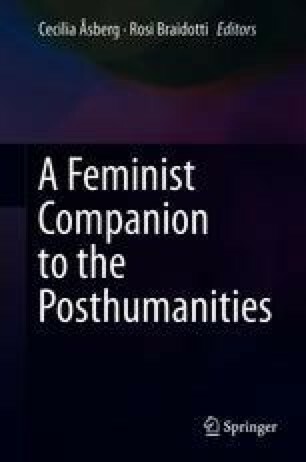 Focusing on the ever-rising presence of macromutation in contemporary literary and visual texts, this article offers an important contribution to feminist, postcolonial, crip and queer thinking on inter-and intra-relationality between species and environments, on difference, and on the temporality of species development. It situates its analysis of Hiromi Goto’s Hopeful Monsters in contemporary Canadian politics of colonisation, multiculturalism and the increased medicalisation of racialised and disabled bodies. In so doing, if offers a considerable contribution to the analysis of the necropolitical landscape of postcolonial belonging, addressing how little known theories of evolution may challenge such structural inequalities and violence.